Ndian, the division responsible for 90% of Cameroon’s enormous oil output, does not have a single filling station. Fuel being sold on the streets of Bamenda, Cameroon. Credit: Mbom Sixtus. Driving the 13 km from Bambui to Bamenda in Cameroon’s North West region, one would be forgiven for thinking the area is big on artisanal oil mining. This region is close the country’s big oil-producing zone, and plastic fuel containers line both sides of the road, attracting a steady flow of customers. This petrol on sale, however, is not from the area. In fact, it’s not from Cameroon at all. Known as “Funge” or “Zoa Zoa”, it has been illegally smuggled from Nigeria. At the side of a road, a vendor fills a customer’s car, using the cut-off top of a plastic bottle as a funnel. His customer Ndi Mowah explains that this fuel is lower quality than at filling stations but that it is also less expensive. He says 30 litres of fuel costs FCFA 17,000 ($32) here rather than FCFA 19,000 ($36) at the pump, though he adds that prices do fluctuate. “When police officers raid this area and collect bribes from vendors, they increase prices to make up for what they paid to the police,” he says. However, Mowah emphasises that price is far from the only benefit to buying petrol in this way. Indeed, similar scenes of people buying and selling smuggled fuel can be seen up and down the country. The sale of illicit Nigerian petrol is widespread despite the fact that Cameroon is one of Africa’s biggest oil-producers and sold 17 million barrels of crude in 2017. In recent years, the government has attempted to clamp down on this trade. In 2016, it launched “Operation HALCOMI”, which has since seized hundreds of thousands of litres of fuel worth hundreds of thousands of dollars. 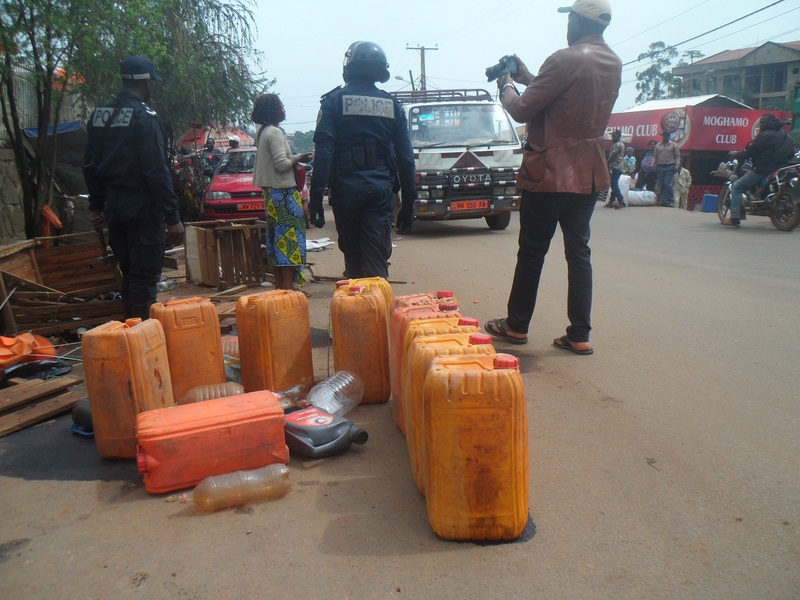 Emmanuel Nkongho Epey, commander of the operation, says the sale of smuggled petrol was previously allowed to grow due to “administrative tolerance”. He suggests that officials permitted the importation of the “low quality” fuel from Nigeria to fill a shortage, but that it is now committed to ending the practice. Ayah Paul Abine, a former MP and current leader of the People’s Action Party, focuses on a different factor. He claims that the underlying reason the illegal practice has spread is because the government has simply failed to provide fuel and filling stations across much of the country. Data from Cameroon’s Ministry of Energy and Water Resources suggests that country has 742 filling stations, but that the majority are located in just three of ten regions: Centre, Littoral, and West. The other regions are much more poorly catered to, including the South West, which produces the vast majority of Cameroon’s oil. According to the ministry’s data, three of the South West region’s six divisions do not have a single petrol station – this includes Ndian, the area responsible for 90% of the country’s massive oil output. According to Jean Marie Wetondieu, head of the customs department in the Far North, the illicit fuel trade cannot be stemmed until this lack of filling stations is addressed. He says that even the few that exist often go empty for months at a time. The crackdown on illicit fuel, however, does not seem to be accompanied by investment. Joseph Kpoumie, head of the customs department in the South West, says the government’s clear priority in the region is to protect the national oil refinery. This has become a particular concern in light of the rising discontentment and protests in Cameroon’s Anglophone regions of North West and South West. Activists complain of marginalisation, underdevelopment and discrimination. Protests have often been suppressed by force. In retaliation, some have called for demonstrators to attack trucks transporting fuel and timber from the South West to the port city of Douala in French-speaking Cameroon. Others have gone as far as to suggest demonstrators blow up fuel pipelines. In September, the governor of the Litterol region claimed an explosion near the main petroleum depot in Douala was the result of a homemade bomb detonated by protesters. Cameroon joined the Extractive Industries Transparency Initiative (EITI) in 2005. Through this programme, the government has to publish the amount of money the extractive sector contributes to the economy each year. According to these figures, the government collected $1.152 billion in taxes from the sector in 2015. Nearly 94% of that derived from petroleum. Tantoh argues that Cameroon’s petroleum code needs to be modified like the country’s 2016 mining code. That legislation contains provisions that ensure resources are ploughed back in the communities from which they are extracted. In his opinion, as well as those of Cameroon’s many vendors and their even more numerous customers, the demand for illicit fuel is unlikely to diminish until this is corrected. The country may produce millions of barrels of petroleum, but as long as that bypasses most of the country, citizens’ best option will continue to be the fuel smuggled from Nigeria which is, by contrast, “available everywhere and at all times”. I ran for president in Cameroon. Here’s what I learnt.